Can a Dogwood Tree Be Grown Indoors? What Time of Year Should You Plant Dogwood Trees? Can Dogwood Trees Grow in Northern Illinois? How Far Apart Should Multiple Dogwood Trees Be Planted? The flowering dogwood (Cornus florida) shows off its "flowers" in spring, but those blooms are actually bracts, a type of leaf (see Reference 1). In addition to their popularity as landscape plantings, these native North American trees have a variety of uses and even legendary significance. American Indians planted their crops when the dogwoods bloomed. They also used dogwood root to treat malaria. The root's inner bark contains the alkaloid cornin (see Reference 3). Flowering dogwoods are prone to fungal diseases and insect damage. Dogwood anthracnose, a leaf disease, has killed many dogwood trees in the eastern United States (see Reference 3). The flowering dogwood produces red fruit in the fall. The fruit is edible, but not very tasty (see Reference 2). The dogwood is the state tree of Missouri, North Carolina and Virginia. It is also the state flower of Virginia (see http://www.usna.usda.gov/Gardens/collections/statetreeflower.html). Wood from the dogwood tree wears smoothly and resists splitting. It is a popular choice for golf club heads, tool handles, mallet heads and spindles. The wood was once used for wheels, hay forks and machine bearings (see Reference 3). The flowering dogwood grows to about 20 feet. According to legend, Jesus Christ was crucified on a cross made of dogwood. Afterward, God decreed that the dogwood would be a small tree so that it could no longer be used for crosses (see Reference 3). The bark of mature dogwood trees is segmented into small blocks so that the texture of the tree trunk looks a bit like alligator skin. The tree branches horizontally, creating a rounded crown atop the tree that is wider than the tree is tall. 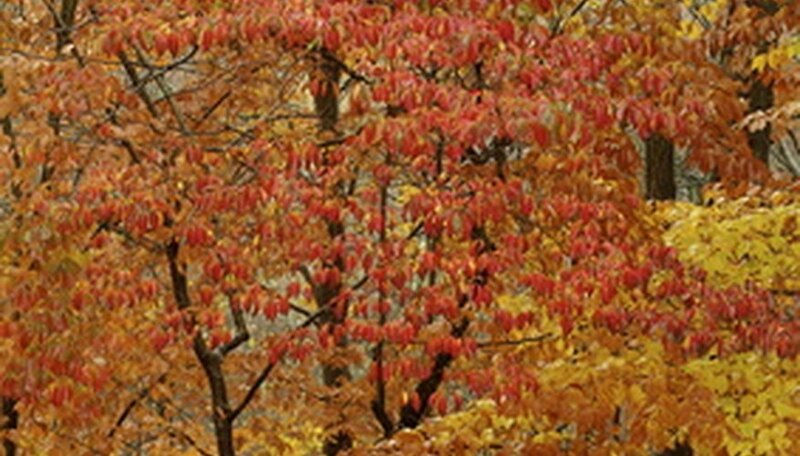 In autumn, the foliage of the tree turns red or purple before dropping off. 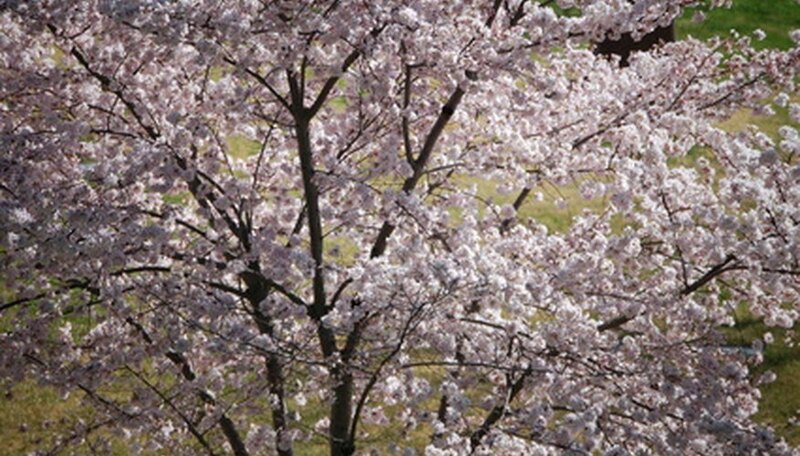 In spring, the tree flowers. The white flowers of the dogwood are actually bracts, which are modified leaves. The true flowers are yellow and very small, surrounded by four bracts. The tree produces red or yellow berries that are poisonous. Within those are one or two seeds. Fruits ripen in the fall. Dogwood doesn't like the stress of poor soil, heat and drought. If in full sun, the tree needs watering because the dogwood likes partial shade. The best time to prune a dogwood tree is late fall or early spring, just before the new growth starts. Generally this is around March. After pruning, dogwood trees typically undergo fast growth, particularly if planted in well-drained, high-organic soil, with lots of morning sun. Remove any dead, diseased, abrading or dragging branches from the shrub in the early spring, before new growth appears. Removing damage sustained during the winter months can prevent disease and structural problems from developing. Reduce the size and spread of your dogwood bush by trimming the branches down to the desired length. Place each cut on the bias just 1/8 to 1/4-inch above a leaf node or bud to encourage new branching and fullness. Rejuvenate overgrown, misshapen or sparse and scraggly dogwood shrubs by cutting back one-third of the oldest stems severely in the early spring while still dormant. Cut each stem down to the crown of the plant, at the soil line, and discard. Distribute the pruning cuts throughout the shrub so you have a well balanced and roughly symmetrical internal branch architecture when finished. The best dogwood trees to grow in Pennsylvania are those resistant to the dogwood anthracnose fungus that first attacked trees there in the 1970s. Kousa dogwood, hardy through most of the state, is resistant to the disease. So are Stellar Kousa and flowering dogwood (Cornus florida) hybrids. Allow the shrub to grow the first year it is in the ground. In the winter or early spring of the second year, use loppers or hand pruners to cut the stems to about 2 inches above ground. The shrub will grow in fuller. Use hedge clippers in the winter or early spring to crop the top or sides to maintain the shrub at a desired privacy or windbreak height and width. Prune each winter or early spring. Cut broken stems and about one-third of both old and new growth to keep the shrub confined. Overgrown dogwood shrubs can be cut to about 6 inches from the ground. Prune your dogwood tree before transplanting. Pruning the branches encourages the energy in the tree to go to the roots instead of the new growth. Dig around the tree and locate the feeder roots. Once you find them, dig down and toward the tree, ensuring that you find the entire root ball. Remove the tree gently from the ground, and shake most of the dirt off the roots. Dig a hole two times the depth and width of the root ball. Fill the hole with water, thoroughly saturating the soil in the new hole. Place the dogwood in the new hole. Apply composting material around the base and add the soil to the hole. After packing down the soil and compost, water the tree again. The flowering dogwood tree has a life span of 5-20 years. It needs light shade to full sun for maximum growth. Dogwood is a smaller tree, approximately 30 feet in height and 35 feet in width. It has green leaves that turn red and purple with the fall. Flowers are four petals (white or pink), and cluster. The red fruits are 1/2 inch long and shaped like a football. Cornus florida needs partial shade but can tolerate full sun. Full sun is best in northern areas and partial shade in the hotter southern areas. It must be watered during droughts, but will be fine with normal dry periods. The flowering dogwood is hardy in USDA hardiness zones of 5 to 9. To propagate the dogwood you must use greenwood cuttings if in spring. For summer propagation, you need hardwood cuttings. Diseases that can blight a dogwood can include dogwood blight, cankers, leaf blight, or powdery mildew. Also twig borers can infest a tree. These occur more frequently in wet weather. They are a favorite among birds and the squirrels for the red fruits. Dogwood trees grow best in well-drained soil, partially shady conditions and room for a root spread that can grow several feet past the canopy spread. If the proper requirements are met, a dogwood tree may be grown indoors. However, for best results, grow dogwood trees outdoors. Prune dead, diseased or injured branches. Cut them off at the branch collar, the slight swelling that forms a ring around the branch, right next to the branch from which it grows. Prune any branches that cross each other or rub against another branch, cutting just above the branch collar. Remove any shoots growing from the base of the gray dogwood tree or from below the graft union. Cut off any low-hanging branches that could interfere with someone walking under the tree. Spring is the best time of the year to plant dogwood trees. Damp soil and a cool atmosphere is present, which aid in the tree's development. Illinois lies in USDA plant hardiness zones 4b to 6, with winter low temperatures of minus 25 to 0 degrees Fahrenheit. Flowering dogwood (Cornus florida) grows wild only in the southern half of the state. Pagoda dogwood (Cornus alternifolia) is a 15- to-30-foot dogwood tree native to northern Illinois. Dogwood trees will need an acidic soil for proper growth. Acidic soil is soil that is under 6.8 pH. When you plant numerous dogwood trees, they should be separated by a distance of at least five times the width of the root ball in acidic soil. While dogwood trees can be planted year-round, they should never be planted in soil that is frozen or hot. 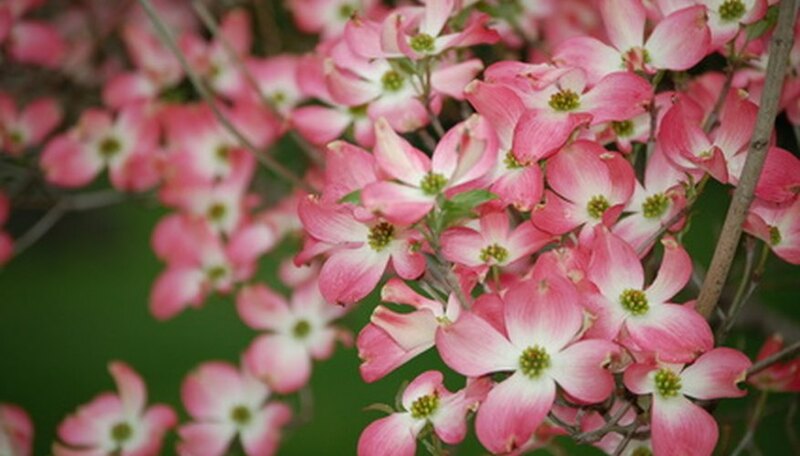 The pink dogwood is a tree with gnarled, curled branches and pink blooms that house tiny, yellowish flowers inside. The pink dogwood tree grows all over the continental United States and southern Canada. C. florida rubra is a variety of dogwood with pink blooms and red leaves. Cherokee sunset and Junior Miss also bear pink bracts. Stellar pink dogwood is a type of pink dogwood bred to be resistant to fungal disease. Most other dogwoods bear white blooms. A pink dogwood tree usually grows to be about 20 to 25 feet tall. Dwarf varieties of the dogwood tree grow 5 to 7 feet tall. In the southern United States, many dogwoods grow to be around 40 feet tall. Pink dogwood trees bloom at different times of year depending on their locations. Dogwood trees in the southern United States bloom in March, while dogwoods in the north bloom in June. The blooms on a pink dogwood tree are not technically flowers. The large pink "flowers" on the dogwood tree are actually protective structures called bracts that house several smaller flowers inside. Dogwoods are particularly at risk for a disease called dogwood anthracnose, a fungus that attacks the leaves of the dogwood, leaving rotted holes in the leaves until it eventually kills the tree. Dogwood anthracnose is contagious among plants and was responsible for the destruction of many acres of dogwood before the cause was discovered in 1988. 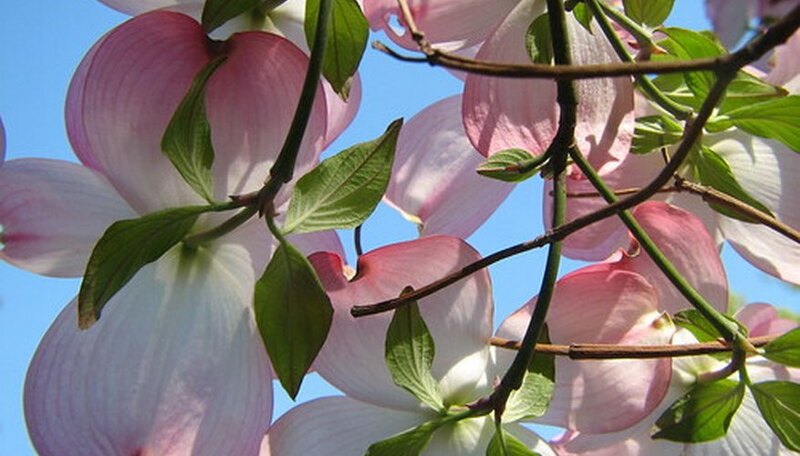 Grow the dogwood tree in filtered sunlight, in an area with low humidity and sheltered from high winds. Provide 1 inch of water a week during the growing season. Fertilize the tree after it reaches two years of age with a 12-4-8 formula, at the rate suggested on the package, in February and June. Spread the fertilizer in a 100-foot radius around the tree. Add a 3-inch layer of mulch to the soil around the dogwood tree. Keep it 3 inches from the trunk and spread it 8 to 10 feet out. Provide fresh mulch every spring. Prune any suckers (small shoots) that sprout from the trunk below the graft union (swollen area on the lower portion of the tree where it was grafted onto stock). These can generally be snapped off by hand. Larger suckers may require pruning shears for removal. Make your pruning choices. Left alone this shrub will reach around 9 feet tall. With pruning it can easily be kept at 4-5 feet tall. Pruning it completely to the ground will result in more colorful red twigs. Prune the shrub. Maintenance pruning can be done in the fall. Remove dead or odd-looking twigs and reduce the overall height by one-third. Wait until early spring if you plan to cut your dogwood to the ground. The idea is to enjoy the red twigs through the winter and then cut them. Clean up and evaluate the site. Haul off the cut twigs. Redosier dogwood spreads by runners and will develop into a clump. Prune away any runners if you do not want more shrubs.